Properties in New Durham average 4.7 out of 5 stars. Property 4: Spacious 3BR New Durham House w/Wraparound Deck! 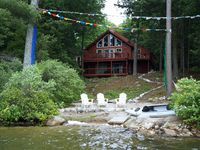 Property 5: Peaceful waterfront retreat only minutes from Wolfeboro. Property 6: Grand View Home overlooks the lakes region, minutes to Wolfeboro! Cozy and Comfortable "A" Frame Chalet Awaits You And Your Family! Property 7: Cozy and Comfortable "A" Frame Chalet Awaits You And Your Family! Property 11: 10 Miles from Gunstock! WATERFRONT!! AMAZING SUNSETS - STUNNING FALL FOLIAGE - SKI GUNSTOCK!! Property 12: WATERFRONT!! AMAZING SUNSETS - STUNNING FALL FOLIAGE - SKI GUNSTOCK!! Property 15: Cozy A-Frame Center Barnstead House on Locke Lake! Beautiful lakefront home with breathtaking sunset views! Property 16: Beautiful lakefront home with breathtaking sunset views! Winter Getaway, a perfect location near whatever you may want to see and do. Property 21: Winter Getaway, a perfect location near whatever you may want to see and do. Property 22: Lakefront living with all of the amenities of home 😎. Book Soon, Summer is Coming!!! Beautiful Area! Property 25: Book Soon, Summer is Coming!!! Beautiful Area! Cozy and comfortable 3 bedroom. Property 31: Cozy and comfortable 3 bedroom. Beautiful home on Sunset Lake, Alton. Minutes to Winnipesaukee. Private beach! Property 38: Beautiful home on Sunset Lake, Alton. Minutes to Winnipesaukee. Private beach! Escape to Beautiful Lake and Mountain Views! Property 44: Escape to Beautiful Lake and Mountain Views! 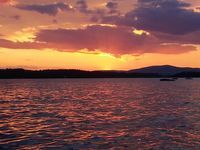 One of the best views of lake Winnipesaukee, mountain views and stargazing. Property 48: One of the best views of lake Winnipesaukee, mountain views and stargazing. Easy drive to Gunstock for skiing. Plenty of beds and seating for a family of four. Nice Spacious home with in quiet area! Me and my family had a real good time here. When we arrived there was wine and chocolates and coffee awaiting to greet us which was real nice! The place had so much room and was clean and very comfortable . Can't say enough about the location and the beautiful view from the looking through the windows or just being on the deck taking it all in. We enjoyed ice fishing all weekend , playing pool enjoyed watching movies on the Huge TV on the comfy reclining couches . And the family just enjoying everything around us sitting by the toasty wood stove on those Feburary nights. The only complaints we had was when we went to grill outside. there was no propane in any of the 3 tanks . Started cooking for 5 minutes and had to finish cooking in the oven. And the dart board had seen better days so we couldn't use that. And we had to supply wood for the woodstove. But overall it was an awesome time and would definently return and appreciated Ann Marie being flexible on the arrival/ departure times. Tom G.